Peter lives in Grottoes, Virginia and has over 30 years of experience in home repair and remodeling. 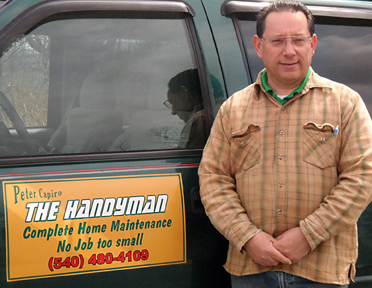 His handyman services range from repairing faulty light switches and dripping showers to complete kitchen and bathroom remodeling. He can repair or remodel from floor to ceiling and everywhere in between, even repairs in your outdoor living areas. Peter has previously worked as a plumbing, water and sewer, culvert and drain line inspector for E & H Engineering in Circleville, New York and formed his own company as Peter Capiro – The Handyman, in 1996. Areas within a 50 mile radius thereof. Peter provides professional service at reasonable prices. Free Estimates. References upon request. Insured. Call (540) 480-4109, or e-mail Peter for a free estimate on your home project.